Market astrologer Tim Bost, the editor of Financial Cycles Weekly newsletter and the author of Gann Secrets Revealed, shares some of the key insights he has gained through decades of research and real-world trading experience. Here you will find powerful components of a successful trading plan, graphically presented in an easy-to-use format that will truly help you integrate and activate the entire Trading Triad-- the perfectly-timed and executed combination of market, trade, and trader. You'll get specific tips for interpreting your own natal horoscope as an Astro-Trader, so you can be more alert to the trading opportunities that are especially good for you. You'll discover astrological tools for market analysis, so you can identify profitable potentials in the markets months or even years ahead of time. You'll also get to know the inner astrological workings of a major stock that moves the markets, revealing the extraordinary ways that the planetary dynamics within critical company horoscopes can establish the true vibrational foundations for hidden technical support and resistance as you actively trade the stock. 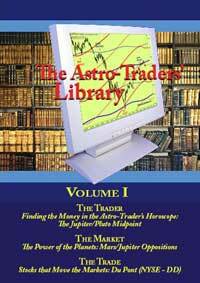 The Astro-Traders' Library is an amazing resource that you will turn to again and again on your way to ultimate trading success!